Editor’s Note: Marina Dock Age talked with a few facilities about the many ways they interact with the government. Every marina and boatyard works with the government in some way, through local, state and federal regulations, or in the permitting process for renovations and upgrades. Many facilities also operate on government land, with government owners and maneuver on a wide spectrum in terms of day to day operations and long-term planning between parties. For this feature, we’ve highlighted just a few of the ways marinas and boatyards interact with government. If we’ve learned one thing in talking with facilities for years about their interactions with the government, it’s be prepared. The Daniele Family owns and operates Southpoint Marina in Rochester, New York, at the south end of Irondequoit Bay. Three years ago the marina completed a significant expansion, increasing the slips from 198 to 311. The permitting process with the New York State Department of Environmental Conservation (NYSDEC) began three years before that. Prior to renovations, the marina was dredged in 2012. The dredging project was proceeded by a five-year permitting process. Thankfully, for all that hard work, the marina has had a 100 percent occupancy rate for the past six years, but it took perseverance and grit by the ownership to pursue expansions. Owner Anthony Daniele said the local municipalities appreciated the investment from Southpoint Marina into the community and were highly supportive of the project. The state agencies took the lead in permitting and approving the project. A few key environmental issues stood in the way of the project, dragging out the permitting process. Irondequoit Bay, 5-miles long by one-mile wide, is considered a class 1 wetland, by NYDEC definition, which makes expansion and dredging difficult to permit. The wetland designation was placed on the bay in the ‘70s, prior to the opening of access to the lake, as a way to limit development in and around the bay. “We were initially trying to change the designation,” Daniele said. “But that turned out to be more of a higher hill than we could climb.” A marina is, however, a permitted use in a wetland, but the criteria and the burden that must be met are much higher. “We ended up going that route and working harder,” he said. The project also had stringent rules on work windows, the time of day and what months of the year work could be performed. The cost of the dredging project increased significantly for sediment disposal. Although the bay was more than 100 feet deep, the material had to be barged out 12 miles to the middle of the lake. The majority of the increased project costs piled up from legal, engineering and other consulting fees that were needed in the back and forth with regulatory agencies. The dredging project removed about 20,000 cubic yards of material. The area had shoaled in over a number of decades, filling in about eight inches. It was last dredged in 1985 and not completely. The dredging project in 2012 removed more than a foot. The project, Daniele said, which should have cost $250,000 to $300,000, cost $700,000 with increased regulatory demands. The permit also allows for maintenance dredging, but that likely won’t be needed for eight to ten years and would be a much smaller project. An American Bald Eagle nest is also about 300 feet from the marina, and presented some regulatory challenges. At the time of the project, the bald eagles had been nesting in the same tree for four or five generations, Daniele said. He also said 20 years ago, there were four eagles in the area, now there are more than a dozen. Environmentalists argued that the marina would hurt the eagles, but Daniele argued that the marina was there first. “We were not scaring away the birds,” Daniele said. “They scavenge on our property.” He said the effort took a certain amount of public and political lobbying to educate those involved. “We were not harming the eagles and had no intention to,” Daniele said. 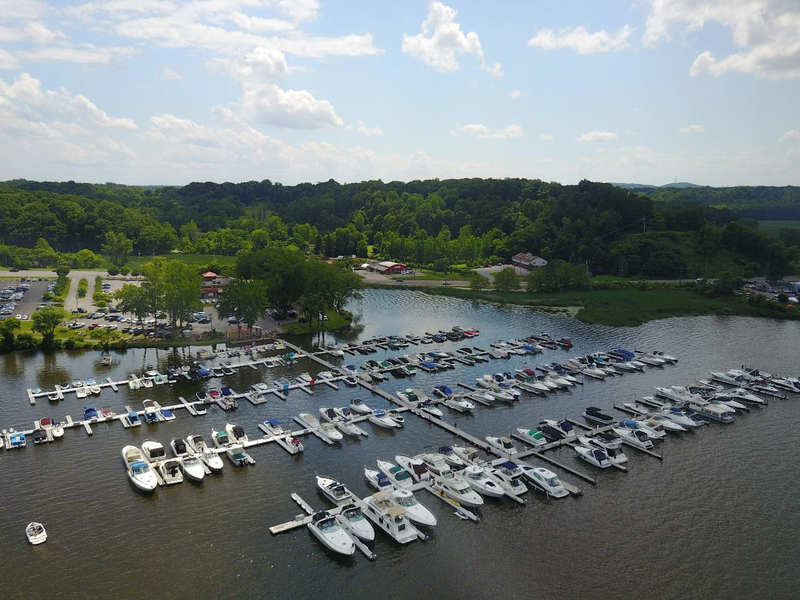 Since the dredging project and dock expansions, the marina has also added many important amenities for its customers – clubhouse, showers and bathrooms, Wi-Fi and expanded parking facilities. The marina has two restaurants on-site. One it manages in-house, and the other is operated by a third party. Minimum wage laws and regulations overseeing employee breaks is the toughest thing about the restaurant business in New York, Daniele said. Sunset Aquatic Marina in Huntington Beach, California, is a County of Orange owned property, leased and managed by GK Management. Nancy Pfeifer, dockmaster, said the county doesn’t have a lot to do with the day-to-day operation of the facility. “The business is ours to run,” she said. The marina operates as an independent business, and per the lease, the county receives a certain percentage of the profits. Although the county leaves the marina operation up to the management firm, marina management does rely on the county in many situations. The county dredges the harbor about once every 10 years, last in 2016. The project is spearheaded and coordinated by the county. The marina management works on-site with the dredging contractors to provide space for staging equipment and temporary offices. It also coordinates during the dredging to move boats for dredging the fairways. “It was a lot of coordination,” Pfeifer said. The county handles the brunt of the permitting and planning for the project. The county also has a presence at the marina. It maintains an easement and reserves property and dock space for the Orange County Sheriff’s Department Harbor Patrol station. While they are not officially part of security at the marina, it brings a certain perception of security to the facility that customers notice. Pfeifer said the harbor patrol is invaluable to the operation, responding very quickly to emergencies. “They are very responsive to us, even where they don’t have to be,” Pfeifer said. One of the biggest emergencies for the marina came when a bridge closure shut off access to the facility. Sunset Aquatic Marina is located on a peninsula in Huntington Harbor, which is only accessible via a two-lane bridge. In May 2015, the Edinger Avenue Bridge was closed for emergency repairs without warning. It closed for seven weeks total, essentially cutting off access to the marina. So Pfeifer got a plan together and went to the county. She scouted out a public dock in the harbor, and asked the county for a water taxi and staff, and a bus to transport boaters from the public dock to the marina. The county was quick to accommodate and access to the marina remained opened. Sunset Aquatic Marina also works with the County of Orange Environmental Health Division’s outreach program. The division coordinated the marina’s oil and bilge pad recycling program. The division also does outreach in the summer months with a booth at the launch ramp, educating boaters about local issues. The marina works with additional state agencies and municipalities on other environmental projects. The California State Parks Division of Boating & Waterways’ Dockwalker program trains marina employees and some tenants on how to interact with boaters to educate them on environmental issues and best management practices. The City of Dana Point provided Sunset Aquatic Marina, and other marinas in the area with trash skimmers that the city had received through a grant program. In the last year, Suntex Marinas has expanded its portfolio into California, working with many different state and federal agencies. In July 2017, Suntex acquired Lake Don Pedro Marina in La Grange, California, and undertook an immediate renovation project. The majority of the marina had 30-year-old or more infrastructure that wasn’t meeting public demand. Suntex worked hand in hand with the Don Pedro Recreation Agency, who leases the marina to the firm and was very involved with reviewing and approving plans, said Quinn Heidenreich, director of mergers and at Suntex. Tiger Docks completed the first phase of the project, and the marina hopes to complete a multi-phase renovation over multiple years. In the last year, Suntex has acquired five California properties total, all dealing with different government agencies. Suntex also operates Moccasin Point Marina in Jamestown, also leased by Don Pedro Recreation Agency; Trinity Lake Resort and Marina in Trinity Center, with the U.S. Forest Service, acquired last October; Oak Bottom Marina in Whiskeytown with the National Park Service, acquired in July 2018; and Pleasure Cove Marina in Napa, with the U.S. Bureau of Reclamation, acquired in August 2018. He said the level of involvement from all these federal agencies in the day-to-day operation is much greater than what Suntex is used to. “Some are involved more and some less,” Heidenreich said. “All are very hands on. There’s a high frequency of communication at the site level and with regional management and with myself at the home office.” Those agencies want to know more information on a regular basis about the operation, and some are more involved with day to day management issues, such as rates changes, which are regulated by most of the government owners. Also, things like logo changes and signage often require approval from the agencies. On some level, every marina will interact with government. It’s important to know local regulators and stay up to date on the issues affecting each facility locally, and at the state and federal level. Each marina’s interaction with the government can vary widely, but together they can learn from one another and prepare their business the best they can.